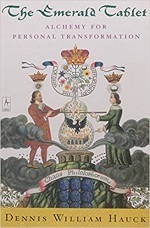 A while ago I wanted to read a book that treats alchemy as a spiritual path rather than giving the next history of “proto science”. Unfortunately my opinion about this book is similar to Ambelain’s Spiritual Alchemy. There are interesting parts, but also large parts that are more like a “spiritual guidebook”. The author sees the Emerald Tablet as the original and major text of esotericism and when its secrets are unraveled, both spiritual and material alchemy belong to your abilities. And so Hauck traces the Emerald Tablet through the ages and regions of the world. Along with that journey Hauck tells about alchemists, Hermetists, old and contemporary. Also he has information about more general spiritual development and comes with meditation practices and the like. He also uses the phases of alchemy to explain phases in spiritual growth and each phase gets an autobiographical story. More interesting (to me) is that he also explains a few alchemical drawings (mostly from Atalanta Fugiens) at length, pointing at details that I never noticed. Overal I found The Emerald Tablet not a boring book, but there are large parts that I read through quite rapidly and only a few parts that are actually interesting.